It's 150 years in the future and mankind has spread throughout the solar system. 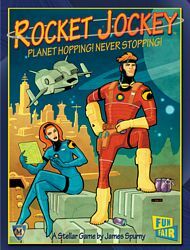 To supply far-flung colonies, they look to the Rocket Jockeys! The planets depend on timely cargo arrivals. This is not enough for the rocket jockeys. They compete with one another to see who can complete the fanciest maneuvers, transport the most important cargo and visit the most planets. You must be daring and you must be quick. You must also be tough, for first contact with alien life is near at hand! Deliver your cargo with the most flair and speed and you will win the game!